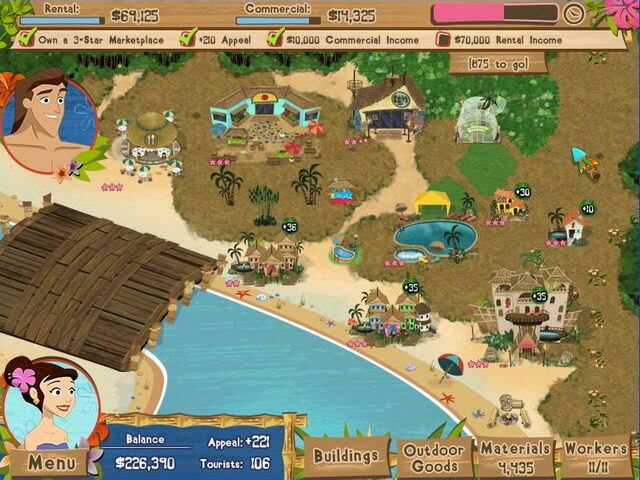 In Coconut Queen, the island of Lui Lui beckons you to bask amid miles of sun-drenched coastline. Disembark into its floral air and discover that you are the island's long-awaited Coconut Queen. Your own private getaway is devoid of females, so find company among the brawny native gents who welcome you with succulent fruits. Just one thing: Build Lui Lui into an idyllic tourist locale or risk its demise. Just one thing: Build Lui Lui into an idyllic tourist locale or risk its demise! ...... Just one thing: Build Lui Lui into an idyllic tourist locale or risk its demise. Qweas is providing links to Coconut Queen 2011 as a courtesy, and makes no representations regarding Coconut Queen or any other applications or any information related thereto. Any questions, complaints or claims regarding this application Coconut Queen 2011 must be directed to the appropriate software vendor. You may click the publisher link of Coconut Queen on the top of this page to get more details about the vendor.